When Hollywood and the theatrical community get together, whether on stage or the silver screen, the results are usually fantastic. In recent years, it seems as if stories based on fairy tale and fantasy themes are at the top of the list for such collaborations. Historically, when thinking about fairy tale crossovers, scripts like THE WIZARD OF OZ and ALICE IN WONDERLAND come to mind. Nevertheless, the trend is alive and well with more modern stories, too. For Theatre Directors, this trend influences the decision-making process when choosing scripts and themes for upcoming events and productions. It’s just that much easier to make your endeavor a success if the audience is interested in advance. Luckily, there are some really great options out there in the fairy tale realm that incorporate great stories, fantastic musical numbers and breathtaking imagery. Let’s take a look at the contemporary story lines that are continuing the reign of the fairy tale on screens and stages of all sorts. 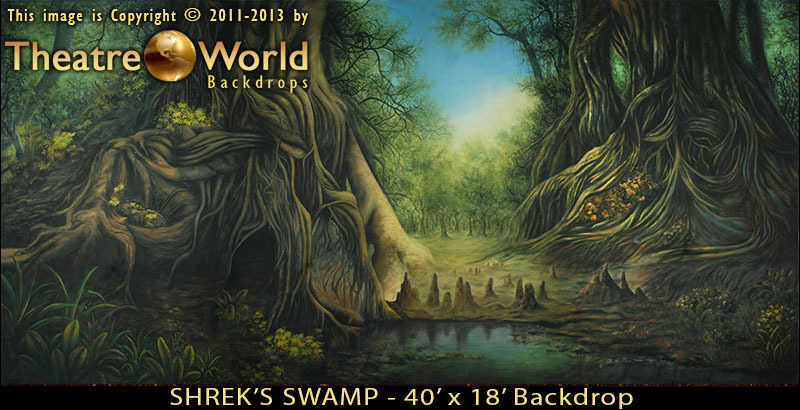 TheatreWorld’s Shrek’s Swamp backdrop is becoming hugely popular as interest in the production grows. Originally a movie brought to us by the team at Dream Works, this script took Broadway and local theaters by storm in the form of SHREK THE MUSICAL. The show boasts loveable characters, great songs and the opportunity to put together some super creative sets. It’s been a hit in the theatrical community–and with good reason! For one, it’s one of the few productions any cast can present. Music Theatre International provides licensing of the full, Junior and Theatre For Young Actors versions, allowing troupes of all sizes and skill levels to present this modern fairy tale. The combination of whimsical plot events and humor that resonates with all age groups makes us think that this production will be gracing stages for years to come. Our show package of SHREK backdrops is available for performances nationwide. As much as we love providing backdrops, it is always a blast to see how different Directors incorporated and personalized elements of the script like Shrek’s Hut and the Dragon herself. 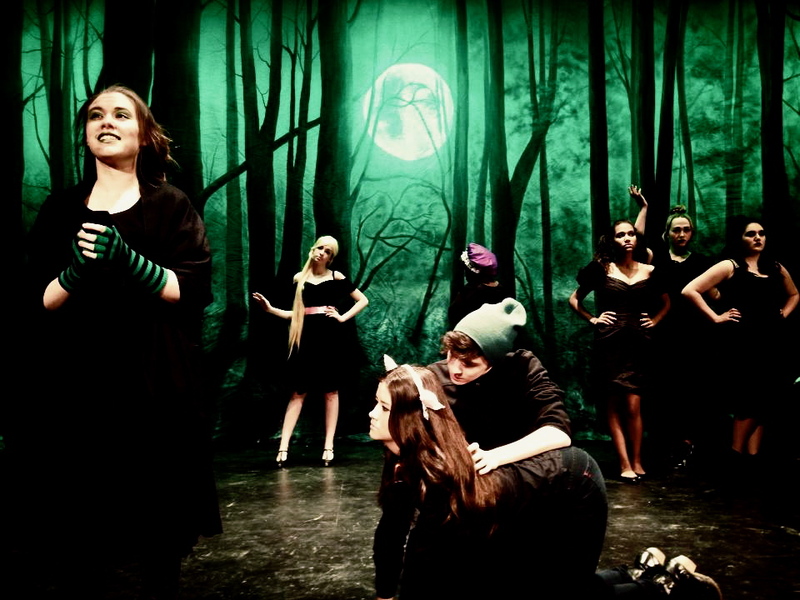 The cast of High Tech Theater during their recent production of INTO THE WOODS. This script made its theatrical debut in the 80’s and has been a go-to on stages large and small ever since. With both a full and Junior version available, the twists in this story show us how some fairy tale stories may really turn out in “real life”. INTO THE WOODS is set to make a jump from musical theater to movie theaters for the 2014 holiday season. Several A-List stars have been cast in key roles, including Meryl Streep and Johnny Depp. Even though audiences might be into modern themes, we all still love a good fairy tale. As always, a feature film adaptation should cause increased interest in this show by the theatrical community. TheatreWorld designed our Santa’s Village drop with ELF THE MUSICAL in mind. This holiday based tale follows the adventures of one Buddy The Elf, who as it turns out is not an elf at all, as he returns to human society. During the story, Buddy shows his family that magic and holiday cheer can make everything better. This script went from Hollywood to Broadway and continues to regain its popularity every holiday season. Last year, it was rumored the show rights would be released to theatrical groups across the country. Ultimately, this proved false. Regardless, we expect to see the rights come available within the next couple of years. (We’re hoping for this year, personally!) MTI even has an email notification set up so interested customers can be informed as the rights become available. You can join their list here if you want to stay in the know. Expect ELF THE MUSICAL to be a staple at community theaters, churches with theatrical capabilities, and schools every December once the rights are released. These modern fairy tales are keeping the genera alive, and arguably on top. The stories are popular on-stage, on-screen, and with audiences of all ages. Fairy tale themes are even taking hold on television. Current programming includes shows expanding on tales from The Brothers Grimm and ALICE IN WONDERLAND. We should all expect to have plenty of options when it comes to fairy tales for years to come. It’s our mission to continue coming up with backdrops that support these themes with stunning artistry. We look forward to hearing about your vision for your own fairy tale twist. This entry was posted in Choosing Your Production, Elf the Musical Backdrops, Fairytale Series, Holiday, INTO THE WOODS, SHREK The Musical Backdrops, Theatre Backdrops, Theatre Trends and tagged Christmas, dance backdrops, Elf, event backdrops, fairy tale, fairy tale backdrops, holiday, into the woods, musical theater, professional backdrops, recital backdrops, Scenic Backdrops, SHREK backdrops, special events, stage backdrops, TheatreWorld backdrops, Theatrical backdrops, theatrical rentals on February 20, 2014 by Skip Mathews.